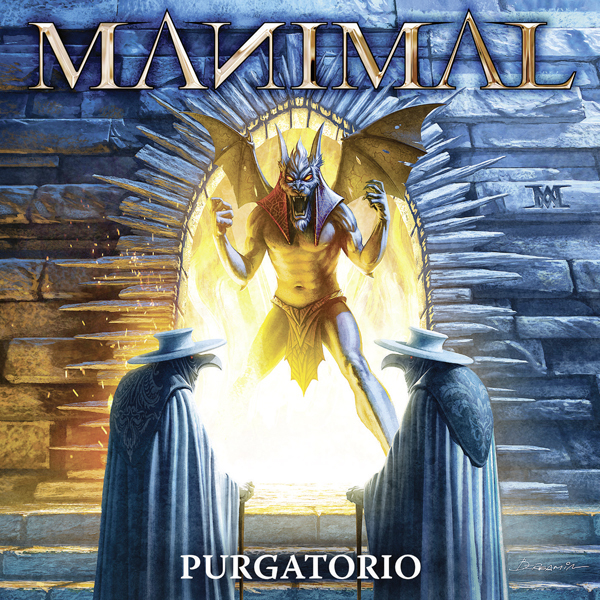 Review: "Manimal: Purgatorio" - Sea of Tranquility - The Web Destination for Progressive Music! The album opens with “Black Plague” and you immediately notice the vocal influences of Michael Kiske (Helloween) and Rob Halford (Judas Priest) which is a commanding change of pace for progressive metal groups who often only have the guitarist steeped in the musical past. Samuel Nyman, the vocalist is gifted with astounding abilities to bring the lyrics to life. “Purgatorio” the title track is the next selection full of power and passion. The music is more towards their own brand of metal but the vocals have a Geoff Tate (Queensryche) edge to them which takes this song in a powerful direction of hyped Dream Theater replete with strong guitar work. On “Manimalized,” the majestic hand of Savatage runs through this song like an injection of mega-adrenaline. It’s another example of progressive metal for this era beginning to take hold again in a new and respectful manner. Towards the middle of the album “Behind Enemy Lines” is perhaps their most fully realized song in the album that combines all their talents and has the least influences from other bands. This is a blazing epic and the drummer is amazing on this track. On to “Denial” the vocalist is right in front spitting fabulous cadence and confident of band cohesion. The last track “The Fear Within” has a gritty but deliberate pace to set up the vocalist to sing nearly absent of the band. For music reviewers this is the moment when you know for absolute certainty of the quality of singing chops. They are in there in spades and makes you that much more wanting to listen intensely as the band. I haven’t many bands providing the last track on the album with so much melody and musicianship. Often times the track is of lesser worth and usually stuff at the bottom. Manimal must be writing an abundant amount of material because there was no filler on this album. I’m a believer in these guys. Check them out and you will not be disappointed. Swedish metal act Manimal caught a lot of attention with their last effort Trapped in the Shadows, and they've continued the momentum here with their latest release for AFM Records, Purgatorio. Fueled by a non-stop avalanche of crunchy guitar riffage and the potent vocal attack of Samuel Nyman, Purgatorio doesn't pretend to reinvent the wheel but instead hits on all the power/traditional metal sweet spots that we all love. "Black Plague", "Spreading the Dread", "Behind Enemy Lines", "Manimalized", and the epic sounding title track all gallop and pulverize, plenty of melody to be found and a smattering of keyboards added in spots for just the right amount of atmospherics. "Denial" even comes close to more recent Judas Priest material, so what's not to like about that? Very solid performances all around, stellar production, and heavy, memorable songs make Purgatorio another winner for Manimal. Check it out.